Last week, the National Anti-Corruption Commission (NACC) in Thailand announced that its eight-person committee voted 5-3 to dismiss a probe into the luxury watch collection of the country’s number two junta leader, Prawit Wongsuwan. Thailand’s manufacturing sector improved slightly in December thanks to growth in output and export sales, according to a survey. Prime Minister Prayut Chan-o-cha said today he is studying policy platforms of political parties before deciding which one he would join in the near future. The Monetary Policy Committee expects any future policy tightening would be gradual after the central bank’s first rate hike since 2011 in December, minutes from its last policy meeting showed on Wednesday. In recent times stakeholders from various sectors have started becoming proactively involved in identifying ways to improve justice. Thai officials believe that two concrete-filled bodies found on the banks of the Mekong river may be those of missing political activists. THAILAND’S measures to prepare for and mitigate extreme weather conditions are facing a tough test as tropical storm makes its way toward the country. Thai Raksa Chart, a party recently formed to capitalize on young voters, has unveiled its four economic policies that emphasize application of new technology to cut costs, to increase revenues and opportunities, to speed up bureaucratic formalities and to promote creativity and innovation. 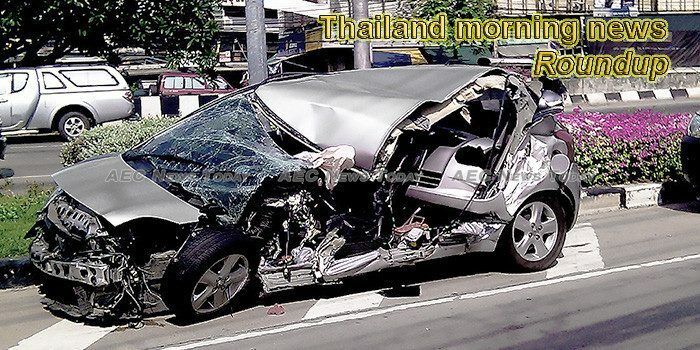 The number of road fatalities is lower so far during this year‘s New Year holidays, but drunk driving and speeding remain the key contributing factors in crashes, accounting for most of the arrests made, Interior Minister Anupong Paojinda told reporters at Government House on Wednesday. Thailand’s national digital ID service is undergoing testing and is expected to be available to the public as soon as three months from now, the Bangkok Post reports a local cybersecurity expert as saying. Public hearings on a project to blast islets to allow large ships to navigate along the Mekong River will be held in this northernmost border province from Thursday through Saturday amid concerns by locals about its impact on the river’s ecology and their livelihoods. The dead whale, believed to be a bruda, the biggest species in the Gulf of Thailand, was found on the beach near the Laem Talumphuk reserve, Amphoe Pak Phanang, Nakhon Si Thammarat Province. POLITICAL activists and dissidents tend to be the victims of privacy violations as they are targeted by government surveillance due to so-called ‘security concerns’, say experts and right defenders. Thailand plans to sell up to ฿141 billion (RM18 billion) of government bonds in the January-March quarter as part of debt-restructuring moves, the finance ministry said on Wednesday. Suraiya first noticed something was wrong with her two-year-old son, Atfan Kuning, when he couldn’t eat or keep any food down. The Angthong National Marine Park off the southern province of Surat Thani will close for three days from Thursday as a tropical storm is expected to hit the region, national park chief Piya Noonin said in a statement. Labour Minister Adul Sangsingkeo has pledged to end conflicts with commercial trawlers before the country ratifies the International Labour Organisation’s (ILO) Work in Fishing Convention, or C188, by the end of this month. His Majesty King Maha Vajiralongkorn has offered his best wishes to Thai subjects on the occasion of the New Year. Amid an escalating trade war marked by tariffs and counter-tariffs on exports, the United States and China are in the midst of a 90-day ceasefire to allow both sides to negotiate. Thailand has become the first country in Southeast Asia to legalize medical marijuana, but the fine print of the legislation has left advocates of the drug’s healing potential with mixed feelings. Authorities and Thais living in South Korea this week rescued a 20-year-old Thai ladyboy who had been lured to Pusan with a promise of work in a cabaret but was instead forced into prostitution.